Development of microalbuminuria increases the risk for cardiovascular disease (CVD) in type 2 diabetes. The nature of this relationship is unclear but may involve arterial stiffness, an independent risk marker for CVD mortality. Aortic pulse wave velocity (Ao-PWV) and albumin creatinine ratio (ACR) were measured in 134 consecutive patients with type 2 diabetes without overt renal impairment (serum creatinine <150 μmol/L). ACR ranged from 0.2 to 153 mg/mmol. Patients with raised ACR (≥3 mg/mmol) had higher Ao-PWV, poorer diabetic control, and higher pulse pressure (PP) and systolic BP (SBP) (all P < 0.05) than those with normal ACR. The closest univariate associations of Ao-PWV were positively with age, duration of diabetes, SBP, PP, ACR, and insulin treatment and negatively with GFR and weight (all P < 0.01). In a multiple linear step-down regression analysis, the significant predictors of Ao-PWV were age, SBP or PP, duration of diabetes, gender, number of antihypertensive medications, and use of angiotensin-converting enzyme inhibitors or angiotensin receptor blockers, which together explained 55% of the variance of Ao-PWV. When ACR was offered in place of arterial pressure to a separate model, ACR emerged as a significant predictor of Ao-PWV. After age adjustment, patients with lower, below median GFR had higher Ao-PWV than those with GFR above the median (P = 0.043). In patients with type 2 diabetes without overt renal impairment, raised ACR is associated with higher Ao-PWV, a relationship most likely mediated by raised BP. The association of Ao-PWV with reduced GFR suggests that even modest renal dysfunction may affect the viscoelastic properties of large arteries. Cardiovascular disease (CVD) is the main cause of death in patients with type 2 diabetes (1). Microalbuminuria in type 2 diabetes is a powerful independent predictor of all-cause mortality; cardiovascular mortality and morbidity, including stroke, myocardial infarction, and congestive heart failure; and progressive renal failure (2–5). Generalized vascular damage may serve as a common pathogenetic mechanism linking microalbuminuria and premature atherosclerosis (6,7). In diabetes, recent evidence indicates that increased arterial stiffness, involving accelerated vascular aging of the aorta, is a powerful risk factor for early mortality (8). 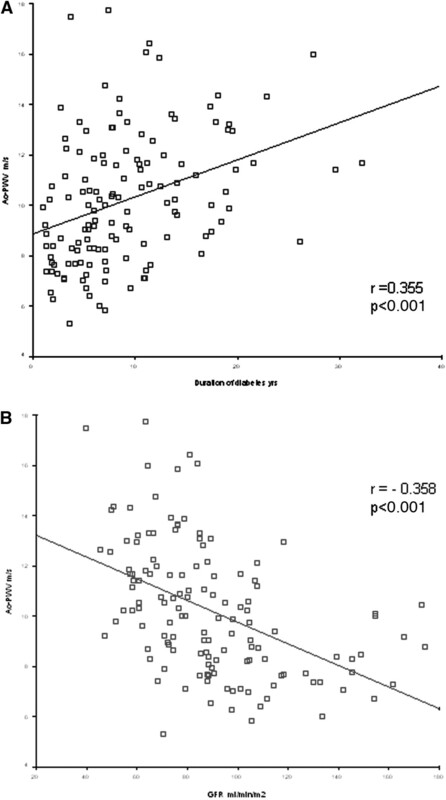 The interaction between increased urinary albumin excretion (UAE) and impaired elastic and mechanical properties of the large arteries in type 2 diabetes has not been fully defined. Arterial wall stiffening is exacerbated by diabetes and hypertension (8,9) and in diabetes is increased in common carotid and femoral arteries (10). Arterial stiffness can be assessed noninvasively by measurement of pulse wave velocity along the thoracoabdominal aortic pathway by a simple and reproducible method (11,12). This method, aortic pulse wave velocity (Ao-PWV), has emerged as the only reliable measure of arterial stiffness that is able to predict outcome in individuals with hypertension (9), type 2 diabetes (8), and ESRD (13). Large artery stiffness is the principal determinant of pulse pressure (PP), and its increase results in unfavorable hemodynamics that affect ventricular afterload and impair coronary perfusion (14,15). Indeed, PP is more closely predictive of mortality in individuals with type 2 diabetes than systolic (SBP) and diastolic BP (DBP) (16). Ao-PWV seems closely related to PP (14,15). Patients with diabetes and ESRD have higher Ao-PWV than those without diabetes, a condition that contributes toward the higher all-cause and cardiovascular mortality in these patients (17). A positive relationship between PP and proteinuria has been observed (18), and in a recent study in Japanese patients with type 2 diabetes, microalbuminuria was found to be independently related to carotid intimal medial thickness (19). Changes in intrarenal hemodynamics that occur early in the course of diabetic nephropathy may also be important in the relationship between initial impairment of arterial elastic properties, as expressed by increased Ao-PWV, and CVD (20). We therefore studied patients with type 2 diabetes with a range of UAE from normoalbuminuria to early macroalbuminuria but preserved renal function to examine whether the degree of UAE was correlated with Ao-PWV and to explore other factors that may determine Ao-PWV. A total of 134 patients with type 2 diabetes were recruited consecutively from the Diabetic Clinic at Guy’s Hospital, London. Diabetes was defined according to the American Diabetes Association criteria (21). Exclusion criteria were a history of ketoacidosis or ketonuria, diagnosis of diabetes before the age of 30 yr and the need for insulin within 6 mo from diagnosis, clinical or biochemical evidence of renal impairment (serum creatinine >150 μmol/L), presence of connective tissue diseases that are known to affect arterial vasculature, history of nondiabetic or obstructive kidney disease, microscopic or macroscopic hematuria, history of glomerulonephritis or nephroureterolithiasis, and pregnancy. History of ischemic heart disease, cerebrovascular disease, peripheral vascular disease, and medication history were confirmed from clinical records. All measurements and procedures were taken with the patients in the fasted state and having refrained from nicotine, alcohol, and caffeine for at least the previous 10 h. Height and weight were recorded, and body mass index (BMI) was calculated as weight/(height2) and expressed in kg/m2. Waist circumference was taken at the level of the umbilicus with the patient in the standing position. BP was measured in triplicate by an automated sphygmomanometer (Omron Digital Blood Pressure Monitor HEM907, Bannockburn, IL) after 15 min of rest in the supine position from the nondominant arm, and the mean value for SBP and DBP was computed from the last two readings. PP was calculated as SBP − DBP. Ao-PWV was determined from carotid and femoral pressure waveforms obtained noninvasively by applanation tonometry (Millar tonometer, Millar Instruments, Houston, TX) using the Sphygmocor system (Atcor, Sydney, Australia). Patients were in the supine position rested for 15 min, and measurements were taken by a single observer (A.S.) in a temperature-controlled (22°C), quiet room. Waveforms were referenced to a concurrently recorded ECG, and carotid to femoral transit time (ΔT) was calculated from the foot to foot time difference between carotid and femoral waveforms. The distance between the surface markings of the sternal notch and femoral artery was used to estimate the path length between the carotid and femoral arteries (L) and Ao-PWV computed as L/ΔT. The within-subject SD of Ao-PWV assessed using this method in our laboratory is 0.5 m/s. The intraobserver coefficient of variation was 3.5%. The urine albumin-to-creatinine ratio (ACR) was calculated from the median of three nonconsecutive overnight urine samples collected 1 wk before Ao-PWV measurement. The use of ACR has the advantage that it corrects for urinary concentration. Normal urine albumin excretion was defined as median ACR <3 mg/mmol. Creatinine clearance was calculated from serum creatinine according to the Cockcroft and Gault formula, which adjusts for age, gender, and body weight (22). Creatinine clearance corrected per 1.73 m2 body surface area was used as an index of the GFR. A fasting blood sample was taken for measurement of plasma glucose (enzymatic colorimetry), serum total cholesterol (enzymatic colorimetry), and serum creatinine (rate reaction method) using a Cobas Mira Plus analyser (Roche Diagnostics, Basel, Switzerland). Urine creatinine (Jaffe reaction) and urine albumin concentration (by immunoturbidimetry ) were determined using a Cobas Mira Plus analyser (Roche Diagnostics). Glycated hemoglobin (HbA1c) was measured by boronate affinity high-pressure liquid chromatography (Primus CLC330, Kansas City, MO). The study was approved by the research ethics committee of Guy’s and St. Thomas’ Hospitals and was undertaken in adherence to the Declaration of Helsinki. All patients gave written informed consent. Descriptive statistics was used for the analysis of demographic and clinical features of the cohort. ACR values were log-transformed before calculation because of their positively skewed distribution. The t test was used to compare patients with normal versus raised ACR. Correlation analysis that was appropriate for the normal (Pearson correlation) or nonnormal distribution (Spearman correlation) of the variable was used to test for associations of Ao-PWV with a number of other parameters. Correlations that were significant at the <10% level were entered in a multiple linear step-down regression model with Ao-PWV as the dependent variable to determine which variables best predicted Ao-PWV. A step-up procedure was also used to cross-check results. Because of the close interdependence of the various BP computations, only one BP measurement at a time was entered in the model. As several of the independent variables are known to be interrelated, a collinearity test was performed to analyze to which extent each of the individual regressors were dependent on the other regressors. Collinearity statistics calculates tolerance for a variable, which is 1 − R2 for the regression of that variable on all of the other independent variables, and the variance inflation factor (VIF), which is the reciprocal of tolerance. When tolerance is close to 0 and thus the VIF is high, there is high multicollinearity of that variable with the other regressors. Because of the close biologic relationship between ACR and arterial pressure, ACR was offered instead of the BP variables to a separate linear regression model to determine its contribution to Ao-PWV. The formula to calculate GFR includes age as one of its factors, and GFR declines with age. To account for these factors, we further examined the relationship of Ao-PWV with GFR by regressing Ao-PWV on age in patients with age-specific GFR above or below the median. Median GFR was calculated for each quintile of the age distribution of the whole cohort. 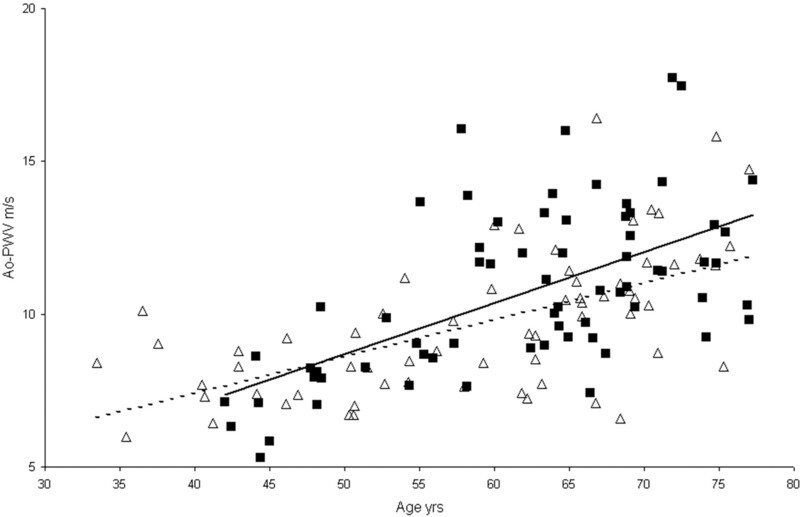 The slopes of the regression lines of Ao-PWV on age for patients with age-specific GFR above or below the median were compared by analysis of covariance. Data are given as mean ± SD, percentage for categorical variables, or median and interquartile range for variables not normally distributed. All data were analyzed using the SPSS 11.5 (Chicago, IL) software package. P < 0.05 was taken as statistically significant. The baseline characteristics of the whole cohort are shown in Table 1. Ninety-two (69%) patients were of white origin, 25 (19%) were Afro-Caribbean, 15 (11%) were Asian, and two (1%) were other. A history of ischemic heart disease and cerebrovascular disease was present in 12 (8.9%) and 11 (8.2%) patients, respectively. Six (4.5%) patients had a history of both ischemic heart disease and cerebrovascular disease. Ninety-eight (73.19%) patients were treated with oral antidiabetic agents, whereas 36 (26.9%) were receiving insulin alone or in combination with oral agents. A total of 106 (79%) patients were receiving antihypertensive agents, 71 (66.7%) of whom were on angiotensin-converting enzyme inhibitor (ACEI) or angiotensin receptor blockers (ARB). Forty-seven (35%) patients were on two or more antihypertensive agents. Sixty-four (48%) patients were on lipid-lowering therapy with a statin, and 22 (16%) were smokers. ACR ranged from 0.2 to 153 mg/mmol, and 51 (38%) patients had elevated ACR (≥3 mg/mmol). Of the 51 patients, 11 had ACR >30 mg/mmol. All patients had serum creatinine <125 μmol/L except two patients with values of 135 and 148 μmol/L. Patients with elevated ACR were older, had longer duration of diabetes, had poorer diabetic control, had higher arterial pressures (SBP and PP), had higher BMI, had greater waist circumference, and had higher Ao-PWV than those with normal ACR (P < 0.05 for all; Table 2). Ethnic distribution and smoking status were similar in both groups. In univariate analysis, Ao-PWV was correlated positively with age, duration of diabetes, SBP, PP, ACR, number of antihypertensive medications, use of ACEI and/or ARB, and treatment with insulin and negatively with weight, height, and calculated GFR at the <5% level. Correlations with fasting plasma glucose and gender had a P < 0.10 (Table 3). Figure 1 graphically represents the relationship of Ao-PWV with duration of diabetes and GFR. Relationship between aortic pulse wave velocity (Ao-PWV) and duration of diabetes (A) and GFR (B) in a cohort of 134 patients with type 2 diabetes. Collinearity statistics for all of the explanatory independent variables entered in the multiple linear regression analysis indicated that in all cases, tolerance values were >0.2 and the VIF was <3. This seemed to exclude a serious problem with multicollinearity. In a step-down multiple regression analysis, age, duration of diabetes, PP (or SBP), gender, number of antihypertensive medications, use of ACEI/ARB, and, more weakly, fasting plasma glucose emerged as the best predictors of Ao-PWV (Table 4 model 1). These variables together explained 55% of the variance of Ao-PWV. The model suggested that an increase of 10 yr in age or duration of diabetes would produce a rise in Ao-PWV of 0.95 or 0.67 m/s, respectively. A rise of 10 mmHg in PP would result in a 0.61-m/s faster Ao-PWV. More antihypertensive medications and use of ACEI/ARB were also related to faster Ao-PWV, suggesting more advanced vascular disease in patients who receive such treatments. A step-up multiple linear regression model by and large confirmed the same variables as best predictors of Ao-PWV with the exception that the effect of fasting glucose was somewhat stronger, accounting for a 0.99-m/s increase in Ao-PWV for each 10-mmol/L increase, whereas the relationship with number of antihypertensive medications and use of ACEI/ARB became weaker and no longer significant. Biologically, arterial BP and ACR are closely related. In this series, the correlation coefficient of ACR with SBP was r = 0.409 and with PP r = 0.479 (P < 0.01 for both). When ACR was offered instead of PP to a separate step-down multiple linear regression analysis, ACR remained as a significant predictor of Ao-PWV in the final model together with age, duration of diabetes, gender, use of ACEI/ARB, and number of antihypertensive medications. A 10-mg/mmol increase in ACR would result in a rise of 0.59 m/s in Ao-PWV (Table 4, model 2). Figure 2 shows the effect of GFR on Ao-PWV over the age range of this cohort of patients with type 2 diabetes. Ao-PWV rose faster with age in patients with age-specific GFR below the median versus those with GFR above the median as shown by a significantly steeper slope of the regression line in those with the lower GFR (P = 0.043). Relationship between Ao-PWV and age in a cohort of 134 patients with type 2 diabetes divided into those with age-specific GFR below (–▪–) or above (–▵–) the median. This study demonstrates that in patients with type 2 diabetes and elevated ACR, aortic stiffness is increased compared with those with normal ACR. The elevated SBP and PP in these individuals is most likely an important mediator of this relationship. Elevated albuminuria is a strong predictor of CVD in the general population and in people with hypertension and diabetes (1–4). Several studies have analyzed arterial stiffness in type 2 diabetes, but there is a paucity of information concerning the relationship between Ao-PWV and albuminuria in these patients (24–26). Yokoyama et al. (19) demonstrated that microalbuminuria was associated with increased intimal medial thickness in type 2 diabetes independent of other conventional cardiovascular risk factors. These authors, however, did not measure Ao-PWV, which represents the gold standard for assessing large artery stiffness. It is analysis of the velocity of the pressure pulse along the descending thoracoabdominal aorta by applanation tonometry (Ao-PWV) (11,12,27) that has established arterial stiffness as a powerful independent predictor of CVD in type 2 diabetes and other medical conditions such as ESRD (8,9,13). In our cohort of patients with type 2 diabetes without overt renal impairment, GFR was negatively associated with Ao-PWV. Ao-PWV rose faster with age in patients with type 2 diabetes with the lower below-median age-specific GFR. This is consistent with the view that GFR, independent of age, contributes to arterial stiffening. Tanawaki et al. (28) showed that GFR was negatively and independently related to carotid artery stiffness in patients with type 2 diabetes, and carotid and aortic stiffness are very closely related. All but two of our patients with diabetes had serum creatinine <125 μmol/L, and none was on renal replacement therapy. This observation complements the findings by Mourad et al. (29), who reported that in individuals who do not have diabetes and normal or elevated BP values and serum creatinine ≤130 μmol/L, lower creatinine clearance was associated with increased stiffness of central arteries and suggests that in type 2 diabetes, the level of renal function, well before renal insufficiency, is an important factor contributing to arterial stiffness. Thus, early kidney functional alterations, per se, seem to interact not only with small but also large artery function, contributing to the development and progression of vascular aging and the atherosclerotic process, as also recently suggested in a population study (30). When renal failure sets in, the rise in pulse wave velocity seems to become independent of the presence of diabetes or the GFR reduction itself (31). Age is a powerful determinant of Ao-PWV (32,33). We confirmed here that this is also the case for patients with type 2 diabetes and a range of albumin excretion rates. Moreover, we found that duration of diabetes, in its own right, is a predictor of Ao-PWV. Ten-year duration of diabetes would affect Ao-PWV to the same extent as a rise of 10 mmHg in pulse pressure or an increase of approximately 6.5 yr in age. A relation between duration of diabetes and Ao-PWV has also been described in Japanese patients with diabetes and without albuminuria (24), although other authors have failed to show this (34). Glycation of structural protein, such as collagen and elastin, with the formation of advanced glycation end products (AGE) in aging and long-standing diabetes may contribute to the loss of arterial wall compliance. These same processes have been implicated in the genesis of albuminuria (35). Compounds that affect AGE formation or break down their structure may affect arterial wall compliance (36,37) and prevent or reduce albuminuria (38,39). In our study, we found no relationship between HbA1c and Ao-PWV, but this may simply reflect the difference between the reversible Amadori compound and the irreversible structural glycation of proteins. Indeed, compounds that affect AGE do not alter the blood levels of HbA1c (38,39). There was a weak association between Ao-PWV and fasting plasma glucose that persisted in the multivariate analysis. Ao-PWV was unrelated to elements of the metabolic syndrome (waist circumference, BMI, and triglycerides) and smoking. This confirms previous observations (19,24,26) but differs from others (40,41). PP and SBP, as expected, were strong predictors of Ao-PWV. Indeed, patients who were receiving multiple antihypertensive drug therapy and ACEI/ARB tended to have faster Ao-PWV. Although ACEI and ARB are known to reduce arterial stiffness (42,43), our findings may merely indicate that it was the most severely affected patients who were receiving multiple antihypertensive medications and inhibitors of the renin angiotensin system. Ethnicity may affect aortic compliance (44); however, the majority of our patients were white, thereby precluding a formal comparison. There were no significant differences in ethnicity between patients with normal and elevated ACR, and ethnicity was not correlated to Ao-PWV. We confirmed in this study our previous observation (45) that diabetic women have a greater age-related stiffening of the aorta than men, a finding consistent with the enhanced vascular risk in women with diabetes. There are limitations in our study. Its cross-sectional nature; the inclusion of patients with pre-existing vascular disease, although <9% of the total cohort; and the coexistence of treatment for diabetes, hypertension, and hyperlipidemia all may have affected the results. However, this is the clinical reality of the patient who has type 2 diabetes and is at risk for early cardiovascular death. We did not measure GFR directly but calculated it from serum creatinine. This may have affected the accuracy of the relationship described. Indeed, more precise determination of renal function may strengthen these associations. In conclusion, our study has shown that aortic stiffness as measured by Ao-PWV, one of the most powerful predictors of CVD in renal failure, is increased in patients with type 2 diabetes and raised ACR. BP is likely to contribute to this association. The inverse relationship of Ao-PWV with GFR suggests that even modest renal functional impairment in type 2 diabetes may affect the viscoelastic properties of the large arteries well before the onset of overt diabetic nephropathy. Age, duration of diabetes, and gender make an independent contribution to Ao-PWV in these patients. Although the last three factors are not modifiable, the other determinants of arterial stiffness are. Intervention strategies that correct determinants of arterial stiffness may lower the risk for future CVD in patients with type 2 diabetes and raised urinary albumin excretion rates. This work was supported by a grant from Novartis Pharma AG (Basel, Switzerland) and was partly presented at the 37th Annual meeting of the American Society of Nephrology, St Louis, MO, October 28 to November 1, 2004. A.S. was a clinical lecturer, J.K. is a Medical Research Council Clinical Research Training Fellow, and L.D.A. is a visiting fellow from the University of Naples, Italy. We thank Jane Fry, RGN, for technical help and assistance and Dr. Stephen Pyke for statistical advice.